Ever since its launch in 2005, YouTube has been a great source for entertainment and education on just about every topic. Entrepreneurship is no exception. Regardless of where you are in your entrepreneurial journey, you’re sure to find something of value in the YouTube channels featured in this article. This article features the 10 best YouTube channels for entrepreneurs, plus a few honorable mentions right at the end. Below the description of each channel, you’ll find links to 3 of my favorite videos from that channel. I’ve included these links because all these channels contain tons of videos, so if you’ve just heard of them, it’s easy to get lost in the sea of information and lose track of time. Yes, you can always binge-watch all the videos from a particular channel, but if you’re like me, not all videos will resonate with you on the same level. So without further ado, here are the 10 YouTube channels every entrepreneur should subscribe to. Gary Vaynerchuk (aka GaryVee) is one of the leading marketing experts in the world and a New York Times best-selling author of books such as Jab, Jab, Jab, Right Hook and his most recent book Crushing It! He has a massive fan following on Twitter, Snapchat, and Instagram, and runs the hugely successful podcast, The GaryVee Audio Experience. If you aren’t already following him on social, his YouTube channel can be a great place to get started. GaryVee uploads new videos every day. As of this date, there are 1,900 videos on the channel. These videos include snippets from his Q&A show #AskGaryVee, his daily video documentary series DailyVee, interviews, and keynote speeches. From personal branding to productivity to social media marketing, GaryVee’s channel covers a wide range of topics that’ll help you grow your business and your personal brand. At 1.5 million subscribers and counting, Gary Vaynerchuk is perhaps the most popular entrepreneur on YouTube. Tim Ferriss is an early-stage technology investor/advisor and the author of four #1 New York Times and Wall Street Journal bestsellers, including The 4-Hour Workweek. I’ve been a fan of Tim Ferriss ever since I first read The 4-Hour Workweek a few years ago. Since then, I’ve been tuning in to his podcast and his YouTube videos on a regular basis and I always look forward to his insightful emails. Tim Ferriss’ YouTube channel is a great resource for entrepreneurs who are looking for productivity hacks, business advice, and interviews. Amidst these insightful videos, you’ll also find random fun stuff. Like two of his most popular videos on the channel are “How to Peel Hard-Boiled Eggs Without Peeling” and “How to do Basic Pen Tricks“. 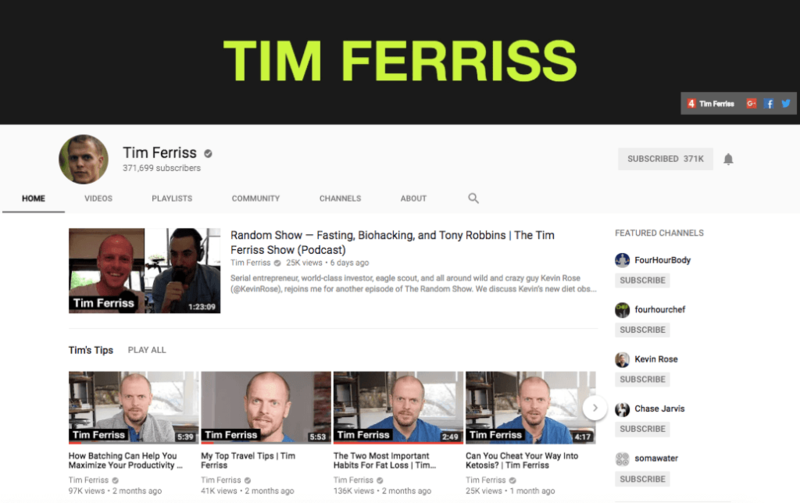 With over 370,000 subscribers to his channel and close to 500 videos, Ferriss’ channel contains a treasure trove of videos for entrepreneurs and marketing professionals alike. Noah Kagan is the founder of AppSumo, the hugely popular marketplace for entrepreneurs, and Sumo, a suite of list building tools for your website. Noah’s YouTube channel features tutorials, motivational talks, and interviews. There’s also the added element of fun and humor in all his videos, so you’re going to learn and be entertained at the same time. Although Noah created his channel seven years ago, he only became active on the platform in the last few months. He has close to 40,000 subscribers to his channel and continues to upload 1-3 videos each month. Pat Flynn is a popular blogger, podcaster, and affiliate marketer, best known for his blog Smart Passive Income and his weekly podcast of the same name. Since 2008, Pat Flynn has built several new passive income businesses and has been publicly sharing everything he has learned along the way. Needless to say, he’s an inspiration to all aspiring bloggers and affiliate marketers. 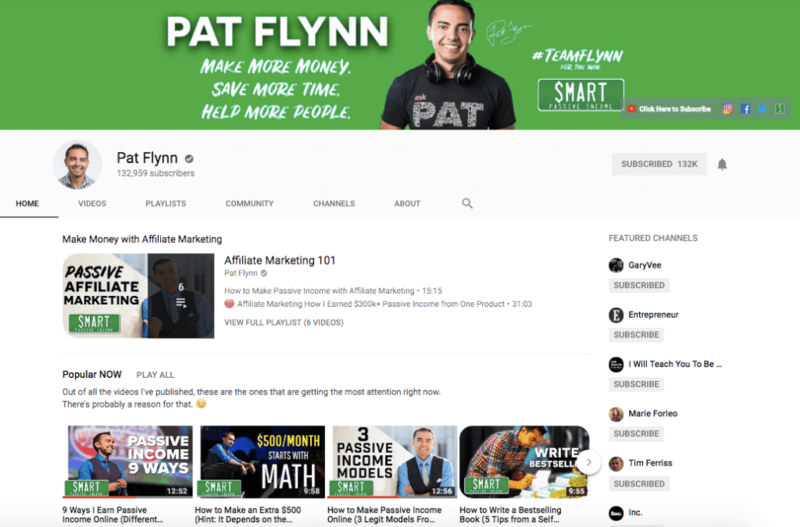 With over 132,000 subscribers, Pat Flynn’s YouTube channel is one of the fastest growing business channels on the platform. His focus for the channel has always been on sharing various techniques to generate passive income online. As such, his channel features tons of strategies and advice that have helped him generate over $5 million in earnings through a diverse set of income streams – from affiliate marketing to books to public speaking. Tony Robbins is an entrepreneur, best-selling author, philanthropist, and business strategist. If you haven’t heard of Tony Robbins, I’d urge you to watch his insanely popular TED talk to get acquainted. Tony Robbins’ YouTube channel contains the right mix of motivational talks, business advice, and life hacks. You’ll not find a lot of long form content on his channel like you probably would on the other channels featured here, but the short form videos are just as good. Tony’s channel has over 464,000 subscribers and it’s showing no signs of slowing down. HubSpot’s YouTube channel has come a long way since it was launched more than a decade ago. For the first few years, the channel mostly featured customer success stories and keynote presentation videos which were mostly targeted towards their target audience i.e., inbound marketing agencies. In recent years, however, the channel has evolved into more of an educational hub for entrepreneurs and marketers alike. While they still upload plenty of videos featuring customer testimonials and keynote speeches, you’ll also find a variety of content on social media marketing, productivity, and emerging technology. With over 57,000 subscribers, HubSpot’s YouTube channel is a must-watch channel for entrepreneurs, bloggers, and agency owners. Founded in 1984, TED has featured numerous talks on many scientific, cultural, and academic topics. 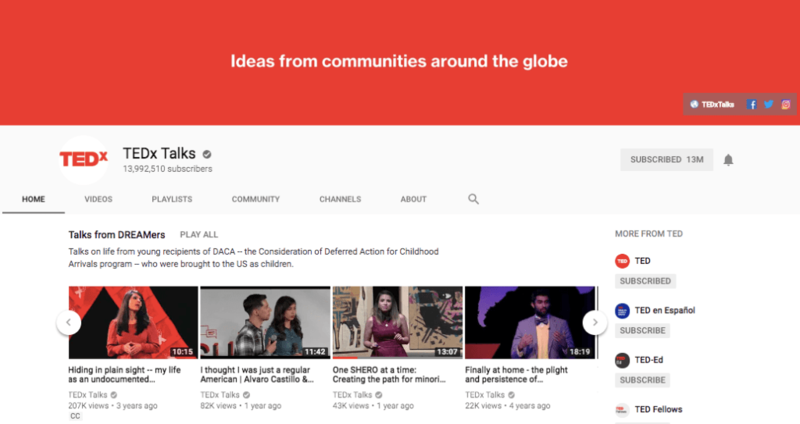 Since June 2006, TED has been offering their talks for free viewing online on their website and distributing them through two different YouTube channels, TED and TEDx Talks. The difference between these two events is that TED takes a more global approach while TEDx focuses on locally-driven ideas and elevates them to a global stage. Lara Stein, founder of TEDx, describes the TED philosophy as “simplified, authentic storytelling” and after you watch a few TEDx videos, you’ll know they strictly adhere to that philosophy. As you’d expect, TEDx talks cover a wide gamut of topics, including entrepreneurship and productivity. It’s not just a great resource for inspiration and learning, but you’ll also realize the significance of storytelling watching the TEDx speakers. TEDx Talks has over 14 million subscribers and a whopping 118,000+ videos. 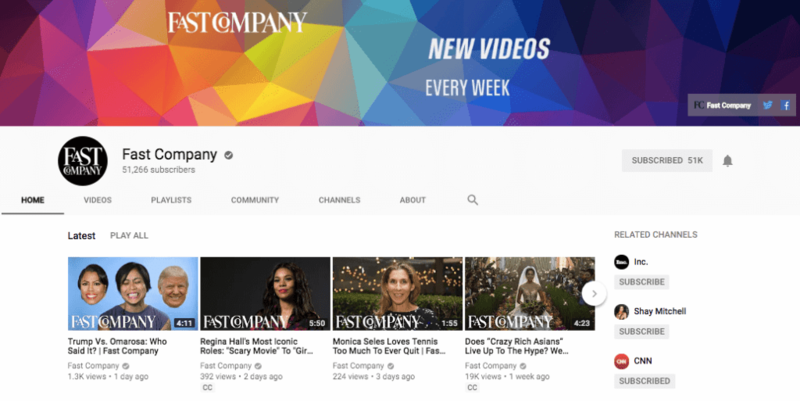 Fast Company’s YouTube channel features tons of business advice from entrepreneurs and creators as well as brand evolution videos of large brands like Apple, McDonald’s, and Coca-Cola. You’ll also find interviews with celebrities who are leveraging social media to grow their personal brand. The channel has over 50,000 subscribers and they upload 3-5 videos each week. Moz builds SEO and content marketing tools, and as such, most of their videos revolve around these two topics. But I consider both SEO and content marketing to be essential aspects of entrepreneurship and play a vital role in growing your business, which is why I’ve featured Moz’s YouTube channel in this list. Furthermore, the founder of Moz, Rand Fishkin, publishes a video on the channel every Friday, called Whiteboard Friday, where he explains and demystifies marketing concepts and reveals actionable SEO and marketing tips. With close to 50,000 subscribers, Moz is one of the most popular SEO channels on the platform. If you’re looking for ways to grow your YouTube channel, you should definitely subscribe to Tim Schmoyer’s Video Creators. Tim Schmoyer covers all things YouTube on his channel, sharing tips and ideas to optimize your YouTube videos for audience development, engagement, and sharing. With 415,000+ subscribers and over 850 videos, Video Creators is one of the best channels for YouTube marketing and growth. 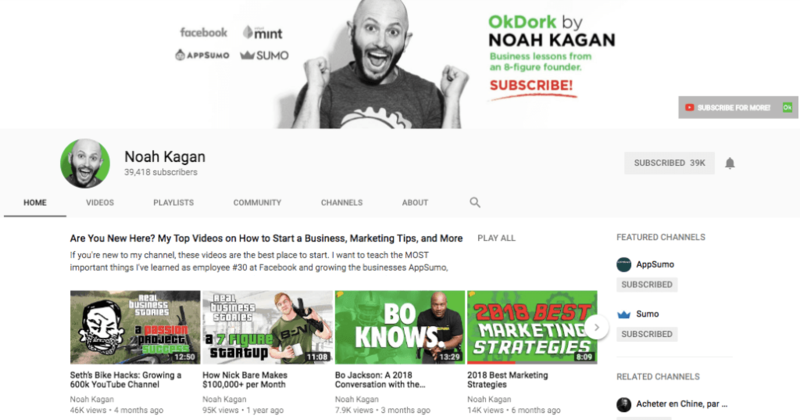 There’s no dearth of content on YouTube when it comes to entrepreneurship and marketing, so I wouldn’t be doing justice to the platform if I just featured 10 best YouTube channels for entrepreneurs. As a result, I’ve mentioned here a few more channels which you should definitely check out. Inc. – The YouTube channel of Inc. Magazine features videos covering virtually every business and management task including marketing, sales, finding capital, managing people, and much more. There are over 800 videos on the channel and Inc. updates it quite regularly with 3-5 uploads every week. To get started, watch this Mark Cuban interview where he talks about his early struggles and biggest successes. Brian Dean – Brian Dean, founder of Backlinko, is one of the most recognized authority when it comes to SEO and link building. As you’d expect, his YouTube videos cover different aspects of SEO – from link building to keyword research to YouTube SEO. Brian Dean has close to 150,000 subscribers on YouTube and focuses on quality uploads rather than quantity. Click here to subscribe to Brian Dean’s YouTube channel. Amy Landino – Amy Landino is an award-winning YouTuber, best-selling author, and professional keynote speaker. Her YouTube channel features tons of productivity and time management tips, and digital marketing advice. Click here to subscribe to Amy Landino’s YouTube channel. Neil Patel – Neil Patel is a serial entrepreneur and one of the top influencers on the web. His YouTube channel is just about a year old, but he has already amassed over 165,000 subscribers. That’s because he updates the channel frequently with 3 videos every week. So there’s plenty of educational content you can look forward to when you subscribe. His delivery may seem forced and awkward at times, but there’s a lot of value in his content, especially if you’re new to marketing. Click here to subscribe to Neil Patel’s YouTube channel. Buffer – Buffer is a powerful social media management tool trusted by millions of brands, businesses, agencies, and individuals worldwide. If you’re looking for quick social media marketing tips, you’ll find Buffer’s YouTube videos extremely useful. Click here to subscribe to Buffer’s channel on YouTube. SEMrush – SEMrush is the de facto SEO and competition analysis tool for marketers and bloggers around the world. SEMrush’s YouTube channel has over 23,000 subscribers and features SEO tips, strategies, webinars, tutorials, and more to help businesses and bloggers get better at SEO and content marketing. Click here to subscribe to SEMrush on YouTube. So these are the YouTube channels every entrepreneur should subscribe to. Whether you’re an early-stage entrepreneur or the CEO of an established business, there’s a lot of knowledge you can gain by tuning in to any of these YouTube channels. I’m sure there are other channels on the platform which I may have missed. Please let me know in the comments section if I’ve missed any of your favorite channels. Great list Sandeep, for me Gary is my favorite, I watch a lot of his content, I also find Alux as an interesting channel for entrepreneurs i watch them too. Thank you! GaryVee is my personal favorite too. Always look forward to his updates on YouTube. Pat Flynn, Tony Robbins and Ted are my favourites. The rest are really good find. Thanks for sharing a very inspiring list. Thanks, Sreejesh. Glad you liked the list!